Earn 125 - 188 points upon purchasing this product. 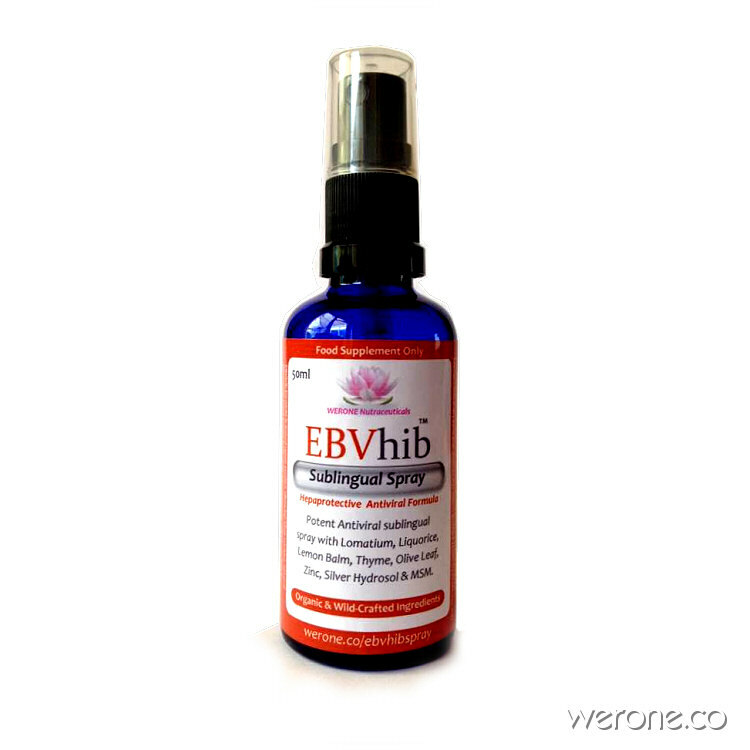 EBVhib sublingual spray formula is based upon studies showing that various natural flavonoids from plants have antiviral properties which can block the viral replication pathways of Epstein Barr Virus, Hepatitis B and C. In EBVhib each ingredient supports the other and it is intended to inhibit viral replication. EBVhib contains Isatis, Liquorice, Elderberry, Scutellaria Baicelensis, Lemon Balm, Thyme, Olive Leaf, Dandelion, Lovage, Zinc, Silver Hydrosol, Distilled Water & MSM. Use 1250 - 1875 points to purchase this product! EBVhib contains Isatis, Liquorice, Elderberry, Scutellaria Baicelensis, Lemon Balm, Thyme, Olive Leaf, Dandelion, Rhodiola, Zinc, Silver Hydrosol, Distilled Water & MSM. Isatis Scientific investigation of the plant reveals that the volatile oil factions in the root contain the antiviral/antibiotic ingredient. Also present are powerful anti-bacterial/anti-fungal properties. The Isatis ingigotica extract has a viro-static effect, meaning that it stops the growth of all viruses, bacteria and fungus in the body and eliminates the lethal micro-organisms without harming the ones necessary to good health. Liquorice contains Quercetin and has been reported to have anti-viral, anti-inflammatory, anti-atopic, hepatoprotective, anti-neurodegenerative, anti-tumor, anti-diabetic effects. Liquorice also moderates cortisol levels. Use the spray to squirt EBVhib under the tongue and hold for a few minutes before gargling and then swallowing, you can also add it in a glass of water. Best taken 3 to 5 times a day. Divergent antiviral effects of bioflavonoids on the hepatitis C virus life cycle. Green Tea is loaded with polyphenols like flavonoids and catechins, which function as a powerful antioxidant. Epigallocatechin-3-gallate (EGCG) is the most studied and bioactive polyphenol in tea and has been shown to be the most effective at eliminating free radicals. Catechins can kill bacteria and inhibit viruses, potentially lowering your risk of infections.